Custom sticky notepads can easily make your business messages stick. These sticky notepads have been an indispensable part of communication even much before computers and mobile reminders happened. You can easily make important information stand up on a messy desk, monitors or walls by sticking these removable customized sticky notepads or Post-it note pads. Available in different colors, shapes, sizes and themes, these sticky notepads easily make one glamorous brand builder for people of all interests. Our prices include online design proof, artwork assistance, artwork corrections and 100% customer satisfaction guarantee. Fast shipping is offered within the contiguous USA. Get your brand logo, slogan and promotional information printed on these promotional sticky notepads prior to distribution! Today, you can easily select personalized sticky notepads in various colors, sizes, sheet sizes and prices. No doubt, these sticky notepads will make a great giveaway during tradeshows, business conventions, and even individual events such as anniversary, wedding or birthday celebrations. Marketers and headstrong individuals who wish to thaw the ice in relationships can offer it as an acknowledgment token or as a value builder based on their preference. Personalized sticky notepads are popular with people of all age groups. Be it students, office goers, homemakers, health aficionados or anyone in haste, they are using Post-it-notepads for communication. We offer a vast collection of sticky notepads designed for home users, students, office users and others trying to pass information. You can invest in this product, keep customers informed of your brand, products, services and encourage them to develop their communication skills. There is a folklore that Great Depression of 1920 happened due to lack of Post-it notes as companies failed to find the right things to promote their business, kids struggled to keep their parents reminded about their essentials and homemakers couldn’t produce grocery lists without sticky notes. If you wish to save your customers from such dilemma, feel free to hand them any of these customized sticky notes. You can select from these displayed items and suggest your personalization preferences. We assure you fully satisfying adhesive notepads reaching your doorsteps in shortest possible time. 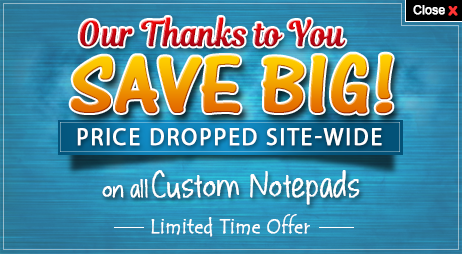 Feel free to reach out to us at 855-8668372 or contact us at info@NotepadsDirect.com.